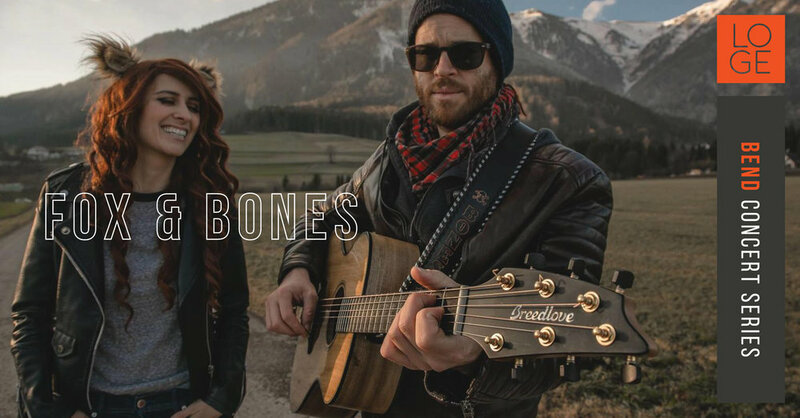 Join us for our indoor live music series featuring Fox and Bones! Based in Portland, OR, these internationally touring sweethearts aren't your average duo. Rather than simply documenting their experiences in song, Sarah Vitort and Scott Gilmore write from the perspective of quasi-fictional characters. There’s Fox, a down-and-out it girl, and Bones, a rootless orphan bad boy with a heart of gold. The two fall for each other, decide to hit the road, and never look back. The characters, as well as their real-life counterparts, use music as the canvas on which they paint a new life together that defies traditional relationship roles and life goals. Their music is ripe with vocal harmonies that pull at the heartstrings, and a complex, at times metaphysical, lyrical landscape. Each element serves their stories of a life lived on the road in pursuit of a dream that most never have the courage to chase. Live, they give audiences a peek into their world, and challenge them to believe in life, adventure, and modern love.